MIDTOWN — Kids are accustomed to having their artwork displayed on their parents' fridge — but on Monday, some lucky Manhattan students got to see their work in an exhibit at a Midtown art gallery. "It’s really astonishing to see it in a gallery like this," said Rory O’Neil, a fifth grader at P.S. 75 in Manhattan. O'Neil's painting of the view from his Inwood kitchen window, complete with the Henry Hudson Bridge in the background, is one of 200 paintings, collages, drawings and sculptures now on display at the 1285 Avenue of the Americas Art Gallery between West 51st and 52nd streets. 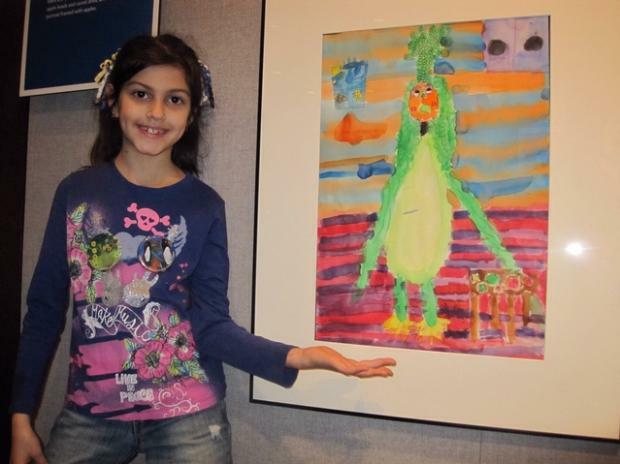 The gallery's "Artists' Eyes" exhibit features the work of students from pre-kindergarten through sixth grade who are enrolled in the "Studio in a School" program. The program reaches 30,000 kids in 130 programs city-wide, and connects students to professional artists who teach them not just to copy techniques but to capture their interpretations of the world, program president Thomas Cahill said. "It’s not a talent program. It’s just tapping into the creativity that’s already there," said Cahill, who said he's constantly amazed by the work students create. "Everything about life shows up in their pictures," he said. One assignment on display asked kids to create portraits of themselves composed of vegetables and fruits. Third grader Emily Martinez, 8, a student at P.S. 255 in Brooklyn, drew herself made with a lettuce body, banana smile and tomato feet. "It’d be fun!" Martinez said of being made out of such healthy food. But, she warned, "I would eat myself if I were made out of strawberries!" Fellow P.S. 255 third grader Emily Friedman, 8, gave herself cherry dimples, an orange head and a pear body with a thin stem serving as her neck and lots of peas for hair. Friedman said she knew she was creating a masterpiece while painting. "I felt the feeling of something being in a special place," Friendman said, adding that she loved getting to see all of the other kids’ artwork in the gallery space. Of course, parents were even more excited than their kids. "I was shocked to see she drew so well," a grinning Javier Martinez, 41, said about his daughter's work. "I was amazed." Emily's mom, Diana Friedman, 37, from Brooklyn, was also thrilled. "Oh my god, I’m on cloud nine,” said Friedman, who works in the building next door to the space and plans to drag her whole office to see her daughter’s work over lunch later this week. "I’m going to show it off to everybody!" she beamed. Mayor Michael Bloomberg also paid a visit to the exhibit for the ribbon cutting ceremony Monday, praising the artists on display. "It just goes to show all ages and any place in the world there are people who are really talented," Bloomberg said. The exhibit will run Monday to Friday, from 8 a.m. to 6 p.m., through May 13.